Quirky Books Author Sandra Bellamy, aka Quirky Books, is known online as Quirky. Sandra started blogging on her quirkybooks.wordpress.com over 5 years ago, to talk about her huge passion, that is writing, to improve her writing skills, find her writer’s voice; and help other writer’s with writing help, hints and tips. Although she started out, initially with this is mind, she always had the intention of writing and publishing her own Quirky Books at a later date, hence why she chose the name Quirky Books. In 2016 and 2017, you will see Quirky Books undergoing changes to focus more on helping others with their writing and more books to help people with their personal and professional development. 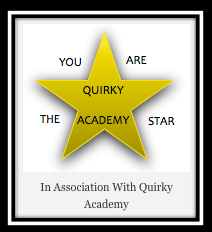 Sandra has built Quirky Academy to help harness and expand upon other’s abilities, talents and skills, to propel them forward in their life and business to live a happy, successful and fulfiling existence. Sandra has a wealth of knowledge and experience, gained through both her personal and professional life, which she believes other people will benefit from knowing. My mission is to help others develop both personally and professionally, to achieve their goals, ambitions and dreams, all the while, embracing their quirky, authentic self.